Chris-Tia Donaldson is the founder and CEO of Thank God It’s Natural (TGIN), a company that manufactures all natural hair and skin care products that she launched in 2013. 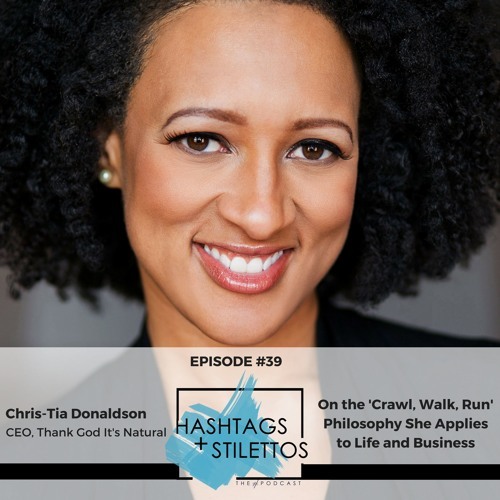 A few years prior to launching the company, Chris-Tia wrote a book about natural hair after struggling with accepting her own while working in corporate America. The book and the product line were well-received, but Chris-Tia decided to keep her job as senior corporate counsel at a Fortune 100 company while she grew the business. After years of performing this delicate balancing act and enduring a months-long battle with breast cancer which is now in remission, Chris-Tia finally walked away from that job to focus on TGIN full-time earlier this year and is now pulling back the curtain to share this part of her journey in hopes that other people can learn something from it. On this episode, I talk with Chris-Tia about her incredible career and entrepreneurial journey so far, how being diagnosed with and surviving breast cancer has influenced and changed her business philosophy and outlook on life, what’s it’s been like working a high-powered job while also running a business that seems to keep growing by the day and so much more. Text HASHTAGS to 444999 to join the email list. Email hashtags@hos-pr.com to submit questions. Social Media: Instagram.com/TGINCEO Instagram.com/TGINatural Twitter.com/TGINCEO Twitter.com/TGINatural www.ThankGodImNatural.com Instagram.com/HashtagsandStilettos Instagram.com/MissSuccess Twitter.com/MissSuccess Hashtag: #HashtagsandStilettos Show Notes: hashtagsandstilettos.com/christia-donaldson Like this episode? Write a review on iTunes! This is a great convo! I love TGIN and I am so happy for Chris-Ta. Many blessings to her:) I also share the same birthday with her lol. This was the best one yet. Sakita, THANK YOU!!! !